Murder by Gaslight: Italian Vendetta. The saloon owned by Joseph Catanazaro was a meeting place for Italian men in South Brooklyn. 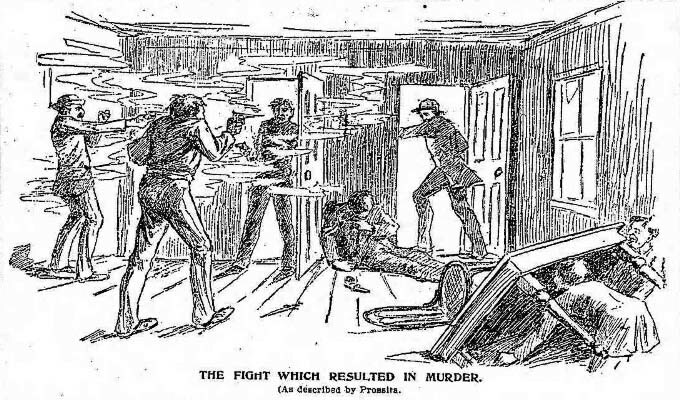 On May 28, 1896, William King, who was shooting dice at Catanazaro’s overheard two men arguing in the back room. Nino Prestijiacomo had come to Brooklyn from Boston to settle a score with Giacchino Cocchiara, and Salvatore Serrio was defending Cocchiara who had been his friend since they were boys in Palermo, Sicily. Serrio angrily walked out of the saloon. Seven years earlier, Giacchino Cocchiara was a barber in Boston. He was married with children, his business was prospering, and he had a comfortable life. In November 1889, Cocchiara went hunting in the woods of Milton, Massachusetts, with two of his employees, Sevario Amato and Agnacio Deluca, and another man. After bagging several birds, they decided to take a rest. Deluca was an excellent shot with a revolver and proposed some target practice as they waited for dinner to cook. They were shooting at a bottle in a fork of a tree when a large dog sprang through the underbrush and made for the men. All ran away except DeLuca who aimed at the dog and shot him in the head killing him instantly. James Cunningham, another Bostonian who had been hunting in the woods witnessed the killing and confronted DeLuca asking why he did it. The two men exchanged heated words then DeLuca raised his revolver and fired at Cunningham, killing him. The police knew the killer was Italian, and as they investigated, they arrested a great many Italian men and were ready to prosecute some with circumstantial evidence. Cocchiara, afraid that an innocent man might be convicted, went to the police and told the truth. He testified that DeLuca had fired in self-defense; DeLuca was found guilty and sentenced to fifteen years in prison. Cocchiara became known as an informer; his testimony was considered an unpardonable crime in the Italian community. Nino Prestijiacomo, a leader in the community, was particularly angry with Cocchiara. About a year after the trial a man attacked Cocchiara in a restaurant with a stiletto. Cocchiara had nearly bled to death, but he survived. He survived two more attempts on his life that year. After a lull of a couple years, Cocchiara thought he was safe and relaxed his vigilance. Then, one evening Cocchiara was walking with Antonio, Armblesas, one of his employees when Armblesas pulled a pistol and started firing, just grazing Cocchiara’s ear. In the fight that followed Armblesas was wounded and subsequently died. Cocchiara learned that his enemies were fabricating evidence that he had intended to kill Armblesas. Cocchiara decided to leave Boston rather than face a trial. He traveled to New York then took a steamer to Bremen. While living in the Italian community there, he had reason to believe that Prestijiacomo had tracked him down. Cocchiara went to Belgium and from there to Buenos Aires, then eventually back to the United States where he settled in a town in Virginia. Cocchiara felt safe in Virginia and decided to send for his wife and children. He went to Brooklyn, to see his old friend Salvatore Serrio who agreed to help. Serrio liked Cocchiara’s description of Virginia, and the two men planned to return together and open a barbershop there. It did not take Nino Prestijiacomo long to learn that Cocchiara was in Brooklyn. He traveled there from Boston accompanied by a man known as Pedro Irish—he was Italian as well but was called “Irish” because he had sandy colored hair. Prestijiacomo and Pedro confronted Serrio in Catanazaro’s saloon. Serrio returned to Catanazaro’s, the night of May 28, accompanied by Giacchino Cocchiara; both men were armed— Cocchiara with a large old pistol borrowed from Serrio. “It is he, Cocchiara, the informer.” Said Prestijiacomo. He and Pedro began firing at Cocchiara. Cocchiara and Serrio drew their pistols and began firing, everyone else ran for the door. One bullet went straight through Cocchiara, doing no permanent damage, but Serrio, caught in the crossfire, lay dead on the floor. Prestijiacomo and Pedro disappeared as quickly as they had arrived. As the men left the saloon, they all dropped their pistols in the street, and the police recovered five revolvers. William King, who had watched the melee recovered the pistol that Cocchiara was using. The slug the coroner removed from Serrio’s heart was a distinctive .44 caliber bullet that exactly matched the empty cartridge in the pistol Serrio had loaned to Cocchiara. Serrio had been shot accidentally with his own pistol. The police tracked down and arrested several men who were at the saloon the night of the murder, including Antonio Cincotta, Vincenzo Procida, and Giuseppe DeSalvo who would be charged with Serrio’s murder—Nino Prestijiacomo and Pedro Irish remained at large. A coroner’s jury heard the evidence and concluded the case was “death by a pistol in the hands of an unknown man.” Though the bullet was proven to come from the pistol carried by Cocchiara, the jury was reluctant to indict a man simply because the bullet fit his revolver. Despite the inquest verdict, the district attorney charged Antonio Cincotta, Vincenzo Procida, and Giuseppe DeSalvo with first-degree murder. In their trial, the following November, the evidence against them was so thin that Judge Hurd criticized the prosecution and directed the jury to acquit the defendants. The jury delivered a verdict of not-guilty without leaving their seats. Throughout the summer, the police and newspapers referred to the case as a Mafia vendetta. Saloonkeeper Joseph Catanazaro and other prominent members of Brooklyn’s Italian community vehemently denied the existence of any such organization as the Mafia. 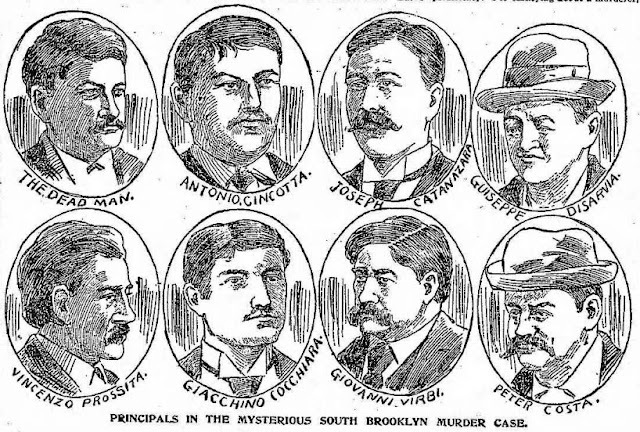 “Alleged Mafia Murder,” Brooklyn Daily Eagle, November 23, 1896. “Mafia or Vendetta Follows Cocchiara,” Brooklyn Daily Eagle, June 7, 1896. “Mafia Suspects Acquitted,” Brooklyn Daily Eagle, November 24, 1896. “Solving a Mafia Mystery,” Brooklyn Daily Eagle, June 4, 1896. “Vendetta A Mystery Still,” Brooklyn Daily Eagle, June 15, 1896. 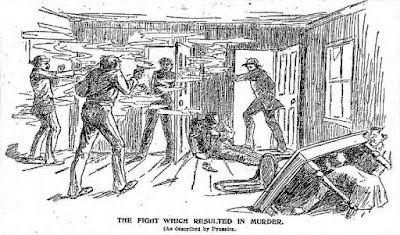 “Was it Serrio's Pistol,” Brooklyn Daily Eagle, June 5, 1896.